The only Japanese director to twice win the Palme d'Or at the Cannes Film Festival, Shohei Imamura has been described by The New York Times as "one of the most significant Japanese filmmakers of the postwar generation." Imamura began his career as an assistant to legendary director Yasujiro Ozu, but, like his colleagues in the New Wave Nagisa Oshima and Masahiro Shinoda, came to reject the restraint and refinement that characterized the masters of the Japanese studio system, saying "I like to make messy films". He directed his first feature, Stolen Desire (Nusumareta Yokujô), in 1958 for Nikkatsu, one of the country's largest studios, for whom he would produce seven more films, including Pigs and Battleships (Buta to Gunkan) (1961), and The Insect Woman (Nippon Konchuki) (1963). In 1965, seeking greater independence, he founded Imamura Productions. The company produced two his best-known features, The Pornographers (Erogotoshitachi Jinruigaku Nyumon) (1966) and TThe Profound Desire of the Gods (Kamigami no Fukaki Yokubo) (1967). 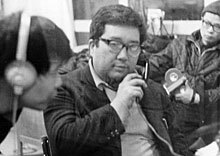 In 1967, Imamura also made his first foray into documentary with A Man Vanishes (Ningen Johatsu), which begins as an investigation into the unexplained disappearance of an office worker — one of many that occurred in late '60s Japan — and concludes as a meditation on the nature of truth and of cinema. The film is an early example of what scholar Donald Richie would call "one of Imamura's major themes... [the] confrontation of illusion with reality (and the resultant problem of telling which is which)." Throughout the 1970s, Imamura continued to explore documentary, directing a series of non-fiction works for Japanese television that "opened up various unhealed wounds from the war years", according to critic Tony Rayns. He remained fascinated by the theme of disappearance and estrangement from Japanese society. Karayuki-San: The Making of a Prostitute (1975) is a portrait of one of the many "comfort women" who were taken from their homes and forced into prostitution for the Japanese army in Southeast Asia. A trilogy of films — In Search of the Unreturned Soliders in Malaysia (Mikikanei O Otte) (1971), In Search of the Unreturned Soldiers in Thailand (Mikikanei O Otte No. 2) (1971), and Outlaw-Matsui Returns Home (Muhomatsu Kokyo E Kaeru) (1973) — explore the lives of ex-Japanese soldiers who rejected Japanese society after the war and remained in Southeast Asia. The Pirates of Bubuan (Bubuan No Kaizoku) (1972) looks at the pirates who work in some of the poorest and remotest islands of the Philippines. Imamura returned to feature filmmaking in 1979 with Vengeance is Mine (Fukushu Suru Wa Ware Ni Ari), based on the true story of serial killer Akira Nishiguchi. He made seven more features before his death from liver cancer in 2006, including multiple award-winners The Battle of Narayama (Narayama Bushiko) (1983), Black Rain (Kuroi Ame) (1989) and The Eel (Unagi) (1997). Karayuki-San, The Making of a Prostitute - Shohei Imamura profiles a Japanese women forced into sexual slavery for the Japanese military in Southeast Asia. In Search of Unreturned Soldiers - Shohei Imamura travels first to Malaysia and then to Thailand, to investigate the lives and experiences of Japanese soldiers who, during World War II, chose to desert.